In the 1880's King Chulalongkorn (the son of Monkut, whose story is told in "The King and I") presented a pair of Seal Point Siamese cats named Pho and Lia to Owen Gould, English Consul-General in Bangkok. Gould took them to London and exhibited them at the Crystal Palace. 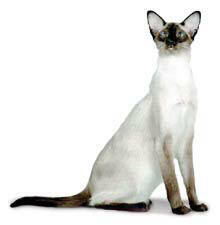 In 1890 Siamese cats landed in America, probably as a gift from the King of Siam to an American friend. Soon after, they were priced as high as $1,000 each. This began the Western era of the breed, early in the nineteenth century. Dark of face and blue-eyed, this chocolate and cream coloured cat is as distinct in form as reputation. Walt Disney's characterization in the cartoon "lady and the Tramp" presents two Siamese cats of cold, conniving personality. Nothing, however, could be further from the truth, in terms of breed, for these emphatic felines are beautiful to look at and to be around and they are anything but mean spirited. It is said that Siamese were once sacred cats, guarding the Buddhist temples. An old fable: One day, a valuable goblet went missing and a pair of cats was dispatched to find the stolen treasure. After a long journey, the goblet was discovered and the female cat stayed to guard it while her male partner went back to tell the good news. So worried was she that the goblet might go missing again, that she wound her tail tightly around its stem and it became permanently kinked. For days and nights she sat watching over the prized goblet, never letting her eyes wander away, and by the time her partner returned, her eyes had developed a squint. Later she produced a litter of kittens - all of which had kinked tails and squints, because of her vigilance in guarding the lost treasure. Another fable relates to a Siamese princess who, fearing that her rings would be stolen, entrusted her Siamese cat to guard them, placing them on its tail for safekeeping overnight. One night, the cat fell asleep, and all the rings fell off her long slender tail and were lost forever. the princess decided to tie a knot in the tail to stop this ever happening again; and this could be another reason why the Siamese have kinked tails. The squint and kinked tail have been bred out and rarely appear in the modern breed. The Siamese is a finely boned and well-muscled cat, with a tail which is long and thin. The proud wedge-shaped head bears regally the ancient lineage of this highborn animal. The ears are quite large, and yet proportionate, the eyes are almond shaped and the fur short and fine. There are five kinds of Siamese: the seal point, the blue point, the chocolate point, the lilac point and the red point. These designations refer to the relative darkness of the extremities - face, ears, tail and feet. Siamese cat myths often tell of humans whose souls have stayed for a time in the body of this royal cat. It is a cat of longevity, and a cat that confers longevity to its owner. Siamese cats don't like to be patronized or trifled with, and their wish is to be with one person, or perhaps two people at one time. Once, in its long history, the Siamese cat was the guardian of the King of Siam's children, and this accounts for the diversity in the cat's vocalisation. No cat has more to say than does the Siamese. If you do not talk to this cat, he will challenge you to do so! If he thinks you are being too quiet, he will put his paw to your lips to make you talk! The Siamese voice is legendary. They speak both with their voice and with their body. They are the quintessential 'people' cat, for they love to be in your lap, on your bed, at your table - and in your heart! This cat will love to travel if started from an early age. A keen explorer and as curious as they come! Brushing of the Siamese must be done sparingly, as too much brushing can damaged the colour of the coat. One technique for removing loose hair is to dampen your hands and rub them backwards in the cat's coat. This will remove loose hair without damaging the new coat. The most popular grooming item for brushing is a small rubber brush that can be bought at most pet stores. If this is used carefully once a week during the spring and less often at other times of the year, it can also safely remove dead hair without damage to the coat. All Siamese are pure white at birth. The colorpoints on the face, ears, tail, feet and legs appear as the kittens mature. Siamese are highly intelligent, loving, independent, talkative and sometimes unpredictable. they demand a great deal of attention and become jealous if they do not get it. They may become attached to one member of the household and take separation very hard. Although they won't come to heel, they enjoy walking on a leash. Siamese are sometimes known as "meezers," an affectionate term for Siamese cats. The Siamese has long been among the preferred pets of so called media stars from Jean Cocteau to Anna Pavlova.